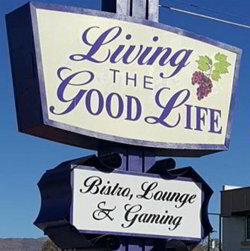 The Mile High Jazz Band performs at Living the Good Life, 1480 N. Carson Street, Carson City, on Tuesday, April 9, 2019, from 7:30 to 9:30 p.m. Admission is free, and donations are greatly appreciated. The Mile High Jazz Band performs at Living the Good Life, 1480 N. Carson Street, Carson City, on Tuesday, May 14, 2019, from 7:30 to 9:30 p.m. Admission is free, and donations are greatly appreciated. 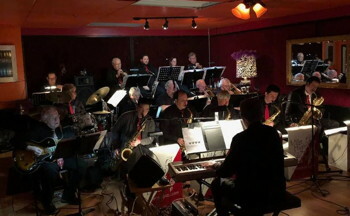 The Mile High Jazz Band performs Jazz & Poetry at CommaCoffee.com on Tuesday, June 11, 2019, from 7:30 to 9:30 p.m. Admission is $5 general and free for age 18 and under. The 2019 Jazz & Beyond Carson City Music festival will be from Friday, Aug. 9, 2019, through Sunday, Aug. 25, 2019. Schedule will be posted at http://JazzCarsonCity.com. The Millennium Bugs will be featured on the 2019 Dangberg Summer Festival on Thursday, Aug. 1, 2019, from 6:30 to 8:00 p.m. at the Dangberg Home Historic Park, 1450 Hwy 88, Minden, NV. Information about the festival can be found at www.dangberghomeranch.org/events. Information about the Millennium Bugs can be found at milehighjazz.com/MillenniumBugs.htm. 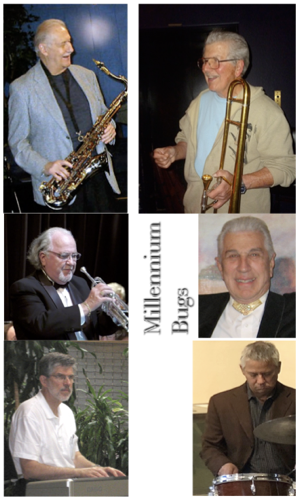 The Millennium Bugs, a jazz combo associated with the Mile High Jazz Band, have been playing a great variety of jazz styles since the late 1990s. They performed for the Carson City Preservation Coalition/Historical Society, Olympic Torch Relay Ceremony in Carson City, Carson City Music Club, Westview block party, Camel Race Day in Virginia City, Carson Nugget showroom, Carson-Tahoe Hospital Foundation, Carson High Prom, BAC Beer Tasting, weddings, receptions, and parties. Although some of the personnel has changed over the years, the group is still inspired to play songs from the "Great American Songbook," inspired by the tradition of spontaneous improvisation. The members are Rocky Tatarelli, tenor sax; Wayne Theriault, trumpet; Don Smaltz, trombone; David Bugli, piano and trombone; George Worth, bass; and Clay Cooper, drums. Please bring your own seating. No dogs allowed at events; legitimate service animals only. All events at the Dangberg Home Historic Park are free to attend unless otherwise noted, and all are free for youth 16 and younger. Many MHJB and MHJB combo gigs are on the second Tuesday of each month from 7:30 to 9:00 or 9:30 p.m. Most of these are at Living the Good Life, 1480 N. Carson Street, Carson City, or at Comma Coffee. The next Jazz & Beyond Festival is scheduled for Aug. 9-25, 2019. Mark your calendars now. The Mile High Jazz Band, an 18-member "big band" composed of 17 instrumentalists and a vocalist, began performing in 1997. The group features music in the Count Basie-Duke Ellington-Woody Herman tradition, as well as more contemporary styles, selected from a repertoire of over 200 tunes. They play ballads, high-powered jazz tunes, and dance music arranged by Nestico, Niehaus, Taylor, and other great arrangers. Mile High Jazz Band performs for community events, fundraisers, dances, receptions, private parties, and in concert. They have played benefits for New York Firefighters, Red Cross Disaster Relief, Carson-Tahoe Hospital Foundation, Douglas County Library Foundation, and the American Cancer Society's Relay for Life. They have been featured in concerts at the Brewery Arts Center and on the Carson City Symphony's "Holiday Treat" and "Pops Party" concerts. They play monthly at Comma Coffee and collaborate with local poets in quarterly "Jazz and Poetry" events, alternating poetry readings with related musical selections. Mile High Jazz Band has performed in Carson City, Reno, Minden, Fallon, Yerington, Stateline, Incline Village, Virginia City, and Crystal Bay. In 2002, Mile High Jazz Band won "Best Band" award in Carson City's "Taste of Downtown." In 2003, American Composers Forum selected Mile High Jazz Band and Bella Voce women's choir for a national Continental Harmony project. In 2007, leader David Bugli received the Nevada Governor's Arts Award for Distinguished Service to the Arts, and the band played for the awards ceremony. Mile High Jazz Band plays annual benefits with the Carson High Jazz Band to help the high school band attend the Lionel Hampton Jazz Festival. Also, the Mile High Jazz Band Association founded and produces or co-produces the annual, multi-day Jazz & Beyond Music Festival in Carson City each August since 2004. The band performs around the Carson City area. You can catch us on most second Tuesdays of each month at Living the Good Life, 1480 N. Carson Street, Carson City, or at Comma Coffee. The Millennium Bugs, a jazz combo associated with the Mile High Jazz Band, play a great variety of jazz styles. They performed for the Carson City Preservation Coalition/Historical Society, Olympic Torch Relay Ceremony in Carson City, Carson City Music Club, Westview block party, Camel Race Day in Virginia City, Carson Nugget showroom, Carson-Tahoe Hospital Foundation, Carson High Prom, BAC Beer Tasting, weddings, receptions, and parties. Mile High Jazz Band Association board meetings are held quarterly. Call 775-883-4154 for details. Help support the Mile High Jazz Band by placing your music orders through Sheet Music Plus. Just click on the link below to get connected. The Mile High Jazz Band Assoc. is a member of the Carson City Downtown Business Assoc.